Marma therapy is the original point system of healing in the body. “Marma” come from the sanskrit “Mru” and which means “To kill” the 107 Marma points are categorised in terms of their effect on the vitality of the body. Marma is one of the unique and important topics discussed in Ayurveda. It plays an important role in surgery. Hence it is rightly called as Shalya Vishayardha. Marma plays a significant clinical role and may be correlated to the Acupressure/Acupuncture. Marma are the critical points of body associated with different organs and nerves. Ayurveda describe use of Marma therapy for various diseases and identification of Marma points which is to be cured, since injury to these Marma points may causes serious harmful effect. Different types of muscles, veins, bones, ligaments and joints meets with each other at the Marma point thus these points acts as a physiological junction. Discussion of Marma points is found in most of the great texts of Ayurveda but the most famous text to explore the subject is the Sushruta Samhita. Vaidya Sushruta described ‘the locations of the Marma points, as well as how they influence Prana. He stated that it is important for the surgeon to have knowledge of these points for the purpose of avoiding them, so as to cut into them could result in a catastrophic outcome. This article summarizes various perspectives of Marma and their clinical importance as per Ayurveda. S, Mamatha T; SWAMY, Shankar S.; SHAILAJA, S. V.. UNDERSTANDING THE CONCEPT OF MARMA AND THEIR CLINICAL APPLICAION IN SHALYA TANTRA W.S.R. TO VITAL POINTS. 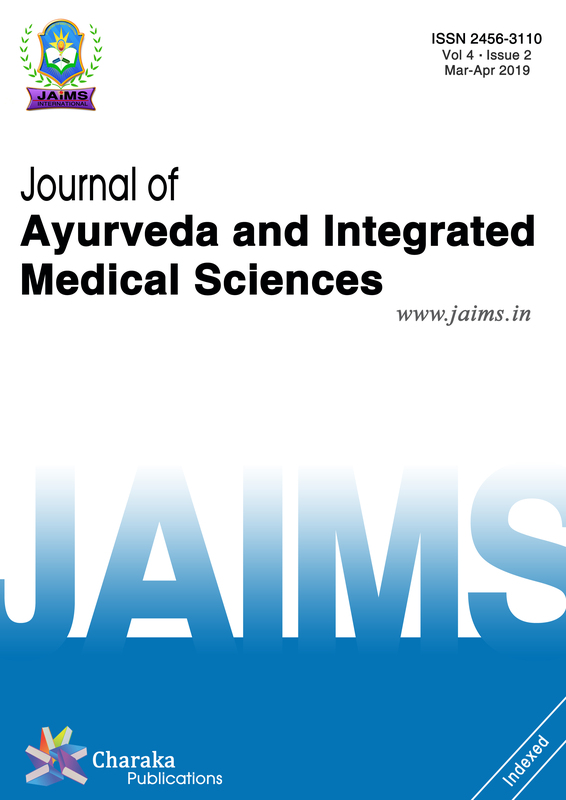 Journal of Ayurveda and Integrated Medical Sciences (ISSN 2456-3110), http://www.jaims.in/index.php/jaims/pages/view/Citation, v. 3, n. 5, p. 89 - 92, oct. 2018. ISSN 2456-3110. Available at: <https://jaims.in/index.php/jaims/article/view/680>. Date accessed: 25 apr. 2019. doi: https://doi.org/10.21760/jaims.v3i5.13823.